one highrise hotel, is ask presencia of police in lobby, where two of his turistanan owing to arrive y uno was at blood. this did take luga diabierna 4.10 at one highrise hotel, where one tourist owing to wordo injury for one man desconoci cu is sell drugs. in the lobby police is come across cu the tourist j.b. of 26 year, was at blood y without camisa together cu one another tourist mericano. they all two was enough bao of influencia of alcohol. 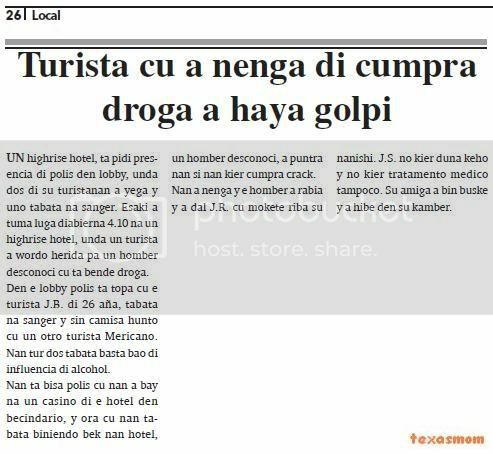 they're tell police cu they owing to bay at one casino of the hotel in becindario, y hour cu they was biniendo bek they hotel, one man desconoci, owing to ask about they if they wanted cumpra crack. they owing to deny y he owing to angry y owing to strike j.r. cu fist on his nose. j.s. does not give complaint y does not tratamento medico niether. his girlfriend owing to come buske y owing to hibe in his bedroom. presencia of police owing to wordo ask diabierna 8.30 of night, at one poolbar in bernardstraat, where the conocido of police, f.g., was stop is keep his ex girlfriend cu machete. one cliente is tell police cu he owing to enter in the bar y owing to menasa the ex girlfriend cu the machete, by cu past owing to mustre the machete bao his cloths scondi. police owing to bay n’e sitio y pafo they're come across cu he f.g. police owing to listra at his curpa y owing to come across cu the machete scondi bao his camisa. the machete owing to stay confisca y f.g.a achieve one cuarto free. police of santa cruz owing to bay cu urgencia diadomingo 1.45 at one cas at macuarima, where supuestamente one problem owing to end in hincamento. n’e sitio, police is talk cu the muher therefore., vuida of k, that is tell cu past owing to hinca his man the. cu cuchiu. police is bay in the cas y is come across the. cu one hinca sit on vlur, in one plas of blood. ambulance owing to take away the. hospital for tratamento, while cu the muher owing to stay deteni y take away keep of santa cruz, where past owing to stay close for investigacion. diabierna mainta the sospechosonan david koolman, jean croes, giomar kelkboom, silvio geerman, raymond maduro, rodolfo amaya, randolf curiel, zahir alli y samira hamadi seddik owing to present in corte for listen they castigo. all is envolvi in the caso big of ladronicia of autonan of companianan of huur car cu owing to achieve the name “stuur”. huez owing to cuminsa cu samira hamadi seddik caminda past owing to tell cu the is achieve seddik culpabel of encubrimento of one car steal. owing to cumpra car steal for of giomar kelkboom. also cu samira hamadi seddik owing to keep cosnan steal of car. huez do not achieve prove cu seddik is form part of one organisacion criminal. according hurispundencia the have to owing to participa y is at height of thing the are was haci is contra ley. huez do not achieve esey prove for samira hamadi seddik y pesey owing to declar’e pound p’e acusacion ey. huez owing to follow tell cu the is as cuenta cu samira hamadi seddik is one first offender y owing to conden’a at 30 day of jail of cual 20 day is condicional kitando the 10 dianan cu seddik was close. huez owing to place one time of proof of 2 year. esey is nifica cu samira hamadi seddik not have to bay close more. huez is achieve randolf curiel culpable of encubrimento although cu curiel is desmenti of had car steal in his power. also huez is achieve prove cu owing to steal car for of one garage. huez do not achieve prove cu randolf curiel was form part of organisacion criminal. past owing to remarca cu at 2005 already end randolf curiel owing to wordo castiga. teniendo all this at cuenta, huez owing to condena curiel at 365 day close of cual 170 day is condicional cu one time of proof of 2 year. huez owing to tell cu diabierne self randolf curiel is wordo let pound. for thing is deal zahir alli, huez do not achieve prove encubrimento. past owing to remarca cu have one person owing to give declaracion, but not have none proof concreto. the another acusacion of form part of organisacion criminal niether is prove. huez owing to declara zahir alli pound y diabierna self past owing to wordo let pound. for thing is deal david koolman, huez is achieve legalmente prove ladronicia y complice of ladronicia of various car. the do not achieve prove cu david koolman is form part of one organisacion criminal. past owing to remarca cu not have pruebanan cu david koolman owing to sell cosnan steal cu the are. huez owing to tell cu the is as cuenta cu the “buki” of castigo cu david koolman have y cu at 2008 owing to achieve castigo condicional. huez owing to confirma exigencia of fiscal y owing to condena david koolman at 1 year of jail, kitando the time cu the is close in kia. huez is achieve legalmente prove cu jean croes is culpable of encubrimento of car cu owing to steal. the do not achieve prove cu jean croes is form part of one organisacion criminal. if the is achieve prove cu jean croes was complice in one caso of maltrato. huez owing to condena jean croes at 365 day of jail of cual 125 is condicional, cu one time of proof of 2 year. for rodolfo amaya huez is hay’e culpable of complice of ladronicia of various car y also encubrimento of car steal. here if huez is achieve legalmente prove cu rodolfo amaya was form part of one organisacion criminal. huez owing to tell cu amaya was know of hortamento y cu will achieve coin of thing sell. the is achieve cu here had cooperacion cu remainder of are. huez owing to as cuenta cu rodolfo amaya is one first offender. also past owing to as cuenta cu the mature cu at kia owing to haci violacion of norm by of prohibi visit y not owing to give rodolfo amaya nothing can escrito p’asina his advocate can owing to defende on the inhusticia here. also huez owing to as at cuenta cu rodolfo amaya owing to coopera cu investigacion. huez owing to condena rodolfo amaya at 18 month of jail, kitando the time cu past owing to sit end in kia. 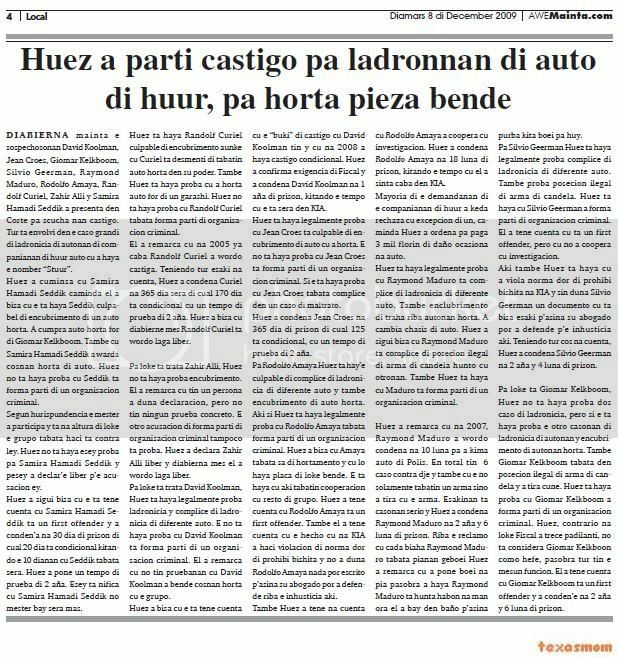 majority of the demandanan of the companianan of huur owing to stay rechaza cu excepcion of one, caminda huez owing to ordena for pay 3 thousand guilder of damage ocasiona at car. huez is achieve legalmente prove cu raymond maduro is complice of ladronicia of various car. also enclubrimento of work on autonan steal. owing to change chasis of car. huez owing to follow tell cu raymond maduro is complice of posecion ilegal of arm of candela together cu others. also huez is achieve cu maduro is form part of one organisacion criminal. huez owing to remarca cu at 2007, raymond maduro owing to wordo condena at 10 month for owing to burn car of police. provided that overall have 6 caso contra dje y also cu the not only had one arm but owing to throw cu the arm. esakinan is casonan earnest y huez owing to condena raymond maduro at 2 year y 6 month of jail. on the reclamo cu cada trip raymond maduro was pianan geboei huez owing to remarca cu owing to place boei at leg because owing to achieve raymond maduro is hunta soap at hand hour past owing to bay in bathroom p’asina try less boei for huy. for silvio geerman huez is achieve legalmente prove complice of ladronicia of various car. also prove posecion ilegal of arm of candela. huez is achieve cu silvio geerman owing to form part of organisacion criminal. past owing to as cuenta cu is one first offender, but cu not owing to coopera cu investigacion. here also huez is achieve cu owing to viola norm by of prohibi visit at kia y without give silvio geerman one documento cu is tell this p’asina his advocate can owing to defende p’e inhusticia here. teniendo all cos at cuenta, huez owing to condena silvio geerman at 2 year y 4 month of jail. for thing is giomar kelkboom, huez do not achieve prove two caso of ladronicia, but if the is achieve prove the another casonan of ladronicia of autonan y encubrimento of autonan steal. also giomar kelkboom was in posecion ilegal of arm of candela y owing to throw cune. huez is achieve prove cu giomar kelkboom owing to form part of one organisacion criminal. huez, contrario at thing fiscal owing to trece front, do not considera giomar kelkboon because; boss, because all have the same funcion. past owing to as cuenta cu giomar kelkboom is one first offender y owing to conden’e at 2 year y 6 month of jail. in name of his cliente sr. chris williams, we owing to achieve one declaracion enough pisa of part of advocate mr. edwin duijneveld, that even owing to cuestiona imparcialidad of ministerio publico. t’asina cu yesterday once more owing to wordo comproba cu not have husticia at we island. despite cu have declaracionan cu not chris williams, but one another person owing to throw day 6 of july 2006 at eagle beach, despite cu not have none proof clave cu chris williams owing to throw corte superior owing to confirma the sentencia of corte of first instancia y is condena williams for 3 year y 6 month, según advocate mr. edwin duijneveld. chris williams is mantene cu the is inocente y cu one another person owing to throw. p’e motibo ey the is bay in cassatie. 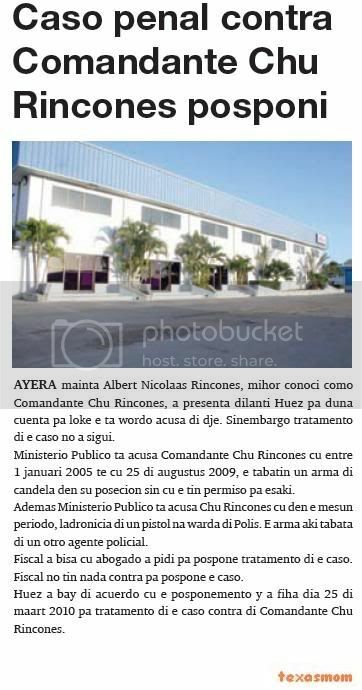 all the investigacion cu owing to wordo haci or mihor tell not haci is one berguensa for we sistema hudicial y is confirma once more cu have klasse justitie keto bay at aruba y cu we organonan hudicial is much putrefy. in the caso here agentenan policial is haci declaracionan false, is falsifica declaracionnan, but ministerio publico is close eye y is try of place all cos in doofpot. till today not did take none medida contra this y is good ask about ministerio publico till what day they're bay permiti this. p’e motibo here his cliente will cuminsa entrega kehonan at corte superior for exigi persecusion hudicial as have to is. because; advocate, mr. edwin duijneveld is tell cu the is compronde his cliente 100%, we all is corda con the agent policial the.v.a. maduro owing to wordo persigi by of ministerio publico cu is in hand of politica, but at end husticia owing to conquer y the is wordo declara pound by of corte superior. aworaki have the conocido wakata more cu 3 month inocentemente close, because agentenan policial owing to work proces-verbal of testigonan cu now is leave at cla cu they not owing to declara this, según advocate mr. edwin duijneveld. despite of this minisetrio publico is haci todo can todo for achieve proof contra dje, immidiately for they tapa one damage more. (nota of red: diabierne now the caso of wakata is come in corte penal, but pro-forma). 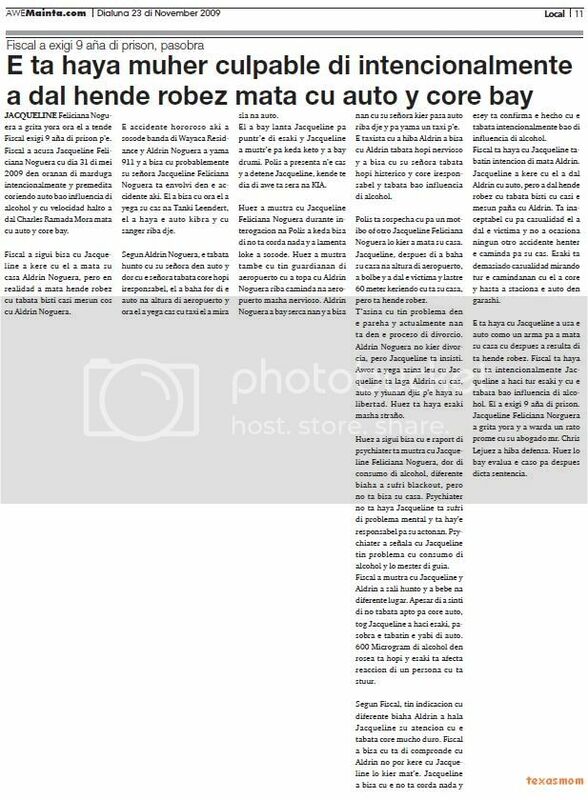 in demasiado caso during interogacionan by of huez comisario is leave at cla cu the proces-verbalnan of police do not cuadra cu locual owing to wordo declara. till what day ministerio publico is sigi tapa y acepta cosnan so. in casonan cu if have to actua for one or another motibo do not happen nothing. a of douane is wordo agredi at aeropuerto, because the is haci his trabao, but till today none accion is wordo take by of ministerio publico contra the person cu owing to haci’e so kitando the feel of is protehi in they trabao of douane. one madam is wordo ataca/agredi more cu 6 trip by of his ex-casa, but till today none accion of ministerio publico. can is hour the madam is die they will haci caso of dje. chris williams is bay in cassatie y probably hour the result tey, past owing to leave end, but the will sigi fight for achieve husticia. “ami will sigi stop near of dje, cu the dolor cu my know the is inocente, because esun cu owing to throw owing to confesa this at my person y 2 advocate more, but because we is mara at reglanan of we trabao we not can declara”, was words of advocate mr. edwin duijneveld, cu as we can see, owing to cuestiona ministerio publico seriamente. 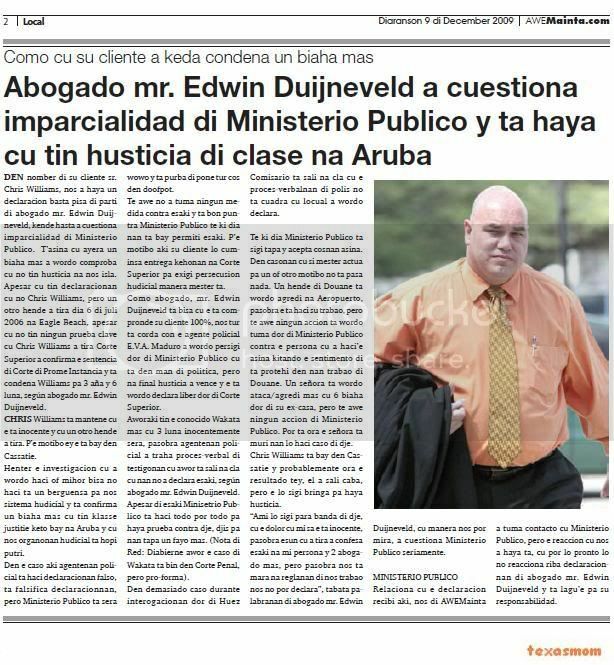 relaciona cu the declaracion recibi here, we of awemainta did take contacto cu ministerio publico, but the reaccion cu we owing to achieve is, cu can will soon will not reacciona on declaracionnan of advocate mr. edwin duijneveld y is lagu’e for his responsabilidad. 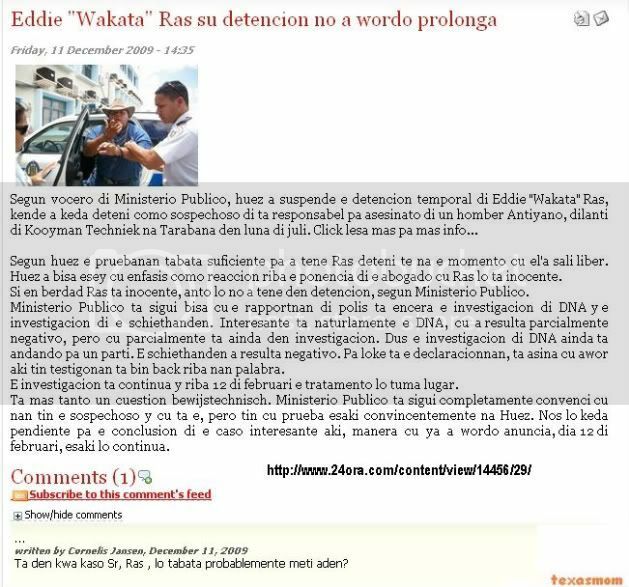 because; advocate of edsel “wakata” ras, edwin duijneveld is tell of did take notice of the comunicado of prensa of the ministerio publico tocante the decision of huez for let his cliente in freedom for miss of sufficient proof contra his person. the is incredibel con the organo cu supuestamente have to is imparcial y busca berdad is try of hustifica trabaonan regrettable y manipulacionnan of near of the team of investigacion cu they, om, is lidera. in they declaracion without none hustificacion they're let know cu wakata t’esun cu owing to throw. is good cu have hueznan cu if know kico is husticia y cu is stop the hendenan here. is tristo cu husticia is in hand of hendenan cu is think cu they're husticia y they can haci y deshaci con they're haci good, advocate edwin duijneveld is follow tell in one comunicado. berdad is cu anteriormente hof owing to rechasa the demanda for let wakata in freedom. but pakico? esey for motibo cu had one declaracion of one witness cu police owing to place on paper. as the declaracion not was company by of the witness, we owing to ask for listen the witness bao of huramento fast huez-comisario. ey owing to leave at cla cu the witness not owing to declara locual police owing to place on paper come across!!! (pa of tanto biaha). in the declarcion of police is poni cu wakata was near of the victima, but the witness is declara bao huramento cu never past owing to tell esey. 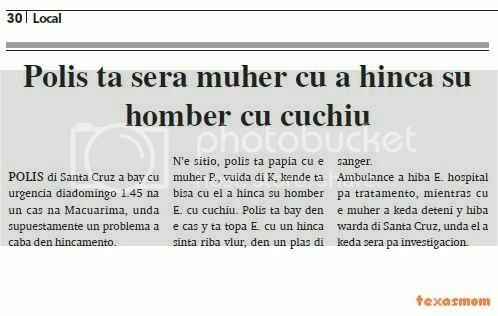 in the declaracion of police is poni cu had none another person in becindario. bao huramento, the witness is tell had various person in becendario of the incidente. now om is tell cu testigonan is change they declaracion p’asina tapa locual recherche owing to haci. witness not owing to change none declaracion, past owing to give his declaracion bao huramento cla y raspa. neither fiscal can owing to splica huez dicon neither the version of the book of the recherche owing to klop cu the version cu the self one police owing to place on paper y firm’e because; declaracion of the witness. the investigacion of restonan of tiramento also owing to leave negative, kiermen not had none indicacion cu wakata owing to throw on his pañanan. the investigacion here owing to tarda more cu 4 month y time cu hof owing to look at the detencion this not was conoci still. 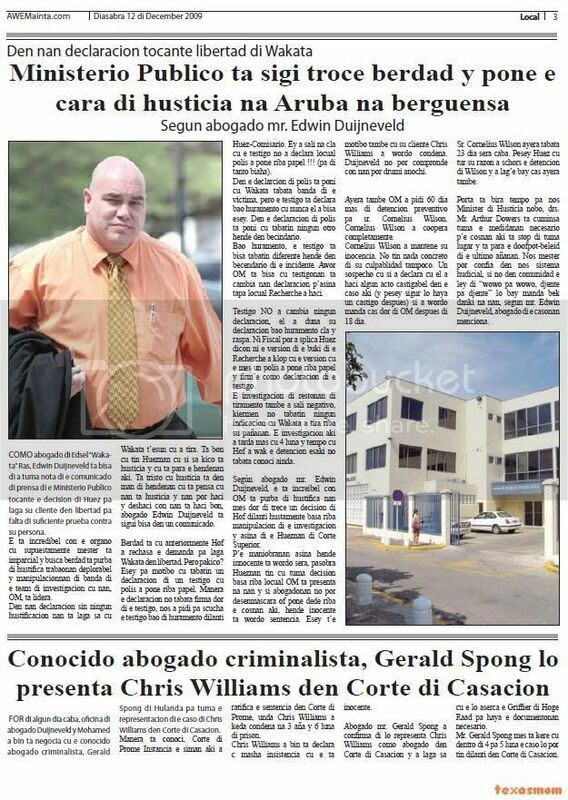 según advocate mr. edwin duijneveld, the is increibel con om is try of hustifica they self by of trece one decision of hof fast just basa on manipulacion of the investigacion y so of the hueznan of corte superior. p’e maniobranan so person innocente is wordo close, because hueznan have cu take decision basa on locual om is present at they y if abogadonan not can desenmascara or place finger on the cosnan here, person inocente is wordo sentencia. esey t’e motibo also cu his cliente chris williams owing to wordo condena. duijneveld not can compronde con they can sleep night. 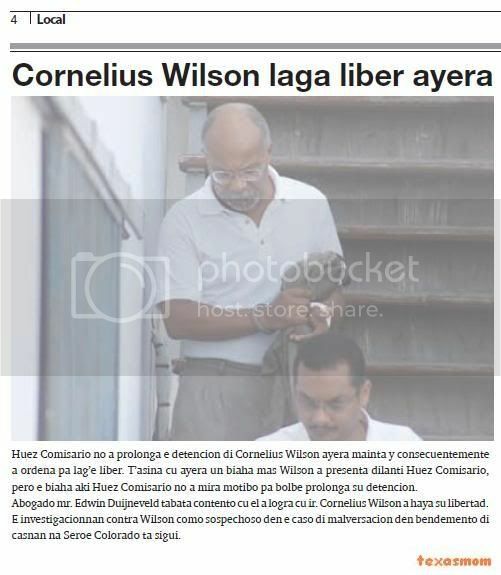 yesterday also om owing to ask 60 day more of detencion preventivo for sr. cornelius wilson. cornelius wilson owing to coopera completamente. cornelius wilson owing to mantene his inocencia. not have nothing concreto of his culpablidad niether. one suspicion cu if owing to declara cu past owing to haci some acto castigabel in the caso here (y pesey assure will achieve one castigo despues) if owing to wordo send cas by of om after of 18 day. sr. cornelius wilson yesterday was 23 day close end. pesey huez cu all his razon owing to schors the detencion of wilson y owing to lag’e bay cas yesterday also. door is become time for we minister of husticia new, drs. mr. arthur dowers is cuminsa take the medidanan necesario p’e cosnan here is stop of take lugar y is stop the doofpot-beleid of the ultimo añanan. we have to can confia in we sistema hudicial, if not in comunidad the ley of “wowo for eye, tooth for djente” will bay send bek thanks at they, according mr. edwin duijneveld, advocate of the casonan menciona. for of some day end, office of advocate duijneveld y mohamed owing to come is negocia cu the conocido advocate criminalista, gerald spong of the netherlands for take the representacion of the caso of chris williams in corte of casacion. as is conoci, corte of first instancia the week here owing to ratifica the sentencia in corte of first, where chris williams owing to stay condena at 3 year y 6 month of jail. 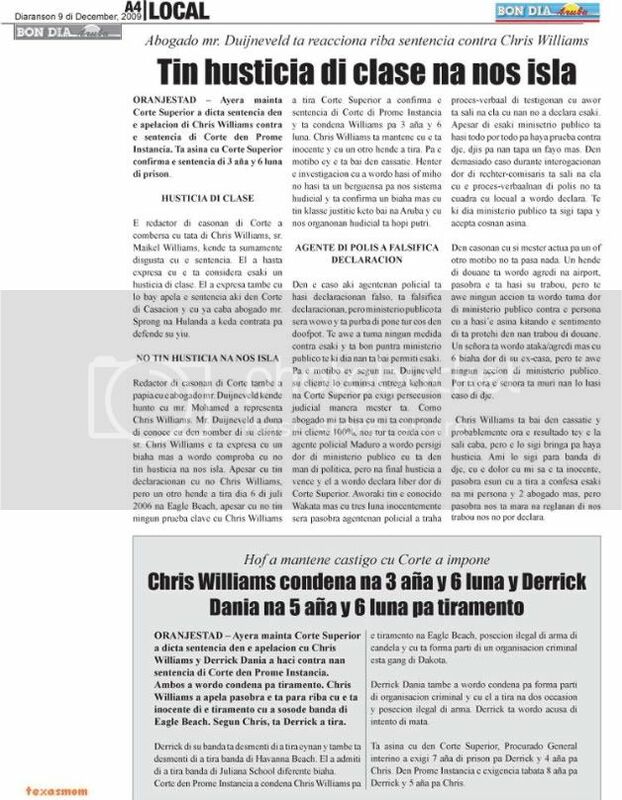 chris williams owing to come is declara c very insistencia cu the is inocente. advocate mr. gerald spong owing to confirma of will representa chris williams because; advocate in corte of casacion y owing to let know cu the will aserca the griffier of hoge raad for achieve the documentonan necesario. mr. gerald spong self is believe cu dentro of 4 for 5 month the caso will can have fast in corte of casacion. yesterday morning in corte of first instancia owing to deal the caso penal cu ministerio publico owing to cuminsa contra patrick van der eem. 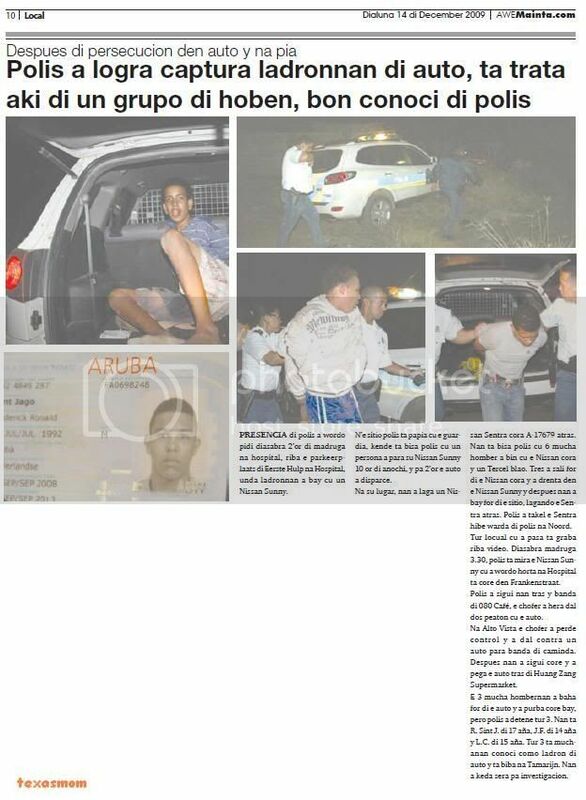 as is conoci at august van der eem owing to wordo deteni at aruba for posecion of drugs y owing to menaza one person. the person is one guardia of seguridad of the hotel caminda patrick van der eem was stay. t’asina cu patrick van der eem not owing to come aruba for stop responsible for thing past owing to haci. past owing to let his advocate mr. the.schwengle defende. fiscal owing to acusa patrick van der eem of posecion of cocaina among 16 y 24 of august 2009. also the is wordo acusa of posecion of marihuana on 16 of august 2009. t’asina cu in two hotel past owing to wordo achieve cu drugs. besides patrick van der eem is wordo acusa of owing to menaza one guardia of hotel in the period of 14 y 17 of august 2009. the will owing to tell the guardia cu the will mate. the guardia is r.v. by cu patrick van der eem not owing to present, huez owing to tell fiscal p’e read his rekisitorio. fiscal owing to tell huez cu the is achieve all 3 acusacion prove. t’asina cu patrick van der eem owing to admiti cu the is one usado of drugs. by cu patrick van der eem owing to smoke marihuana in bedroom of one hotel, one guardia of seguridad owing to bay wing his atencion y bis’e cu according maneho of the hotel the have to pay one multa of 200 dollar. patrick van der eem owing to angry y owing to menaza the guardia of seguridad y after owing to leave of the hotel also. by cu the guardia of seguridad owing to haci denuncia of menaza, patrick van der eem owing to wordo deteni in one another hotel, caminda in the bedroom owing to come achieve drugs. t’asina cu patrick van der eem will owing to menaza the guardia in one club noctorno also. besides the will owing to let know of owing to pay one person 500 dolar for maltrata the guardia of seguridad. patrick van der eem owing to declara at police cu the is using drugs, but the drugs achieve in bedroom of hotel do not of dje. van der eem the was angry y was mouth big, but none instant his intencion was for bay maltrata the guardia of seguridad. fiscal owing to cuestiona the brutalidad of patrick van der eem y owing to tell cu anteriormente owing to arrive at one palabracion cu patrick van der eem, cu if the pay one multa of 2 thousand guilder, the caso penal will not follow. by cu patrick van der eem not owing to haci this, the caso owing to come fast yesterday caminda fiscal owing to exigi 2400 guilder of multa y if patrick van der eem not pay the will have to bay 48 day close. huez after of owing to listen the defence of advocate mr. schwengle owing to dicta sentencia of trip. huez is achieve prove cu patrick van der eem intencionalmente owing to menaza the guardia of seguridad y also cu the was in posecion of marihuana. ORANGE CITY - Patrick van der Eem was yesterday sentenced in absentia because of threats and possession of marijuana. He was imposed a fine of 2000 florin. For possession of cocaine, Van der Eem acquitted. The labrapport the outcome of the test was coke is not included in the file. The Public Prosecutor (OM) went only to 0.2 grams. The prosecution had demanded a fine of 2,400 florin. Van der Eem was held on August 25 for cocaine and marijuana possession and threat of crime against life and of aggravated assault. At his arrest he had a quantity of hashish users and 2.4 grams of marijuana with him. The crime would have occurred under the OM between 14 and August 24. Van der Eem was in August of 2000 florin to the offer to pay for these violations. He paid it not, that Justice decided to prosecute him still. Between 14 and August 17, Van der Eem an employee of the Westin hotel several times seriously threatened. The problems arose when he refused to pay $ 200 extra hotel charges guests who smoke in their hotel room. Van der Eem was then expelled the hotel, but came back with some regularity in order to threaten the employee. Van der Eem said the victim had told him he would kill or shoot. The OM had he expressed the following threat: "If I see you on the street, you notice something happening to you." Similarly, Van der Eem said: "Come to my car and then see what happens, I go shoot. " yesterday morning albert nicolaas rincones, mihor conoci because; comandante chu rincones, owing to present fast huez for give cuenta for thing the is wordo acusa of dje. sinembargo tratamento of the caso not owing to follow. ministerio publico is acusa comandante chu rincones cu among 1 january 2005 till cu 25 of august 2009, the had one arm of candela in his posecion without cu the have permission for this. besides ministerio publico is acusa chu rincones cu in the same period, ladronicia of one pistol at keep of police. the arm here was of one another agent policial. fiscal owing to tell cu advocate owing to ask for pospone tratamento of the caso. fiscal not have nothing contra for pospone the caso. huez owing to bay of acuerdo cu the posponemento y owing to fiha day 25 of march 2010 for tratamento of the caso contra of comandante chu rincones. ORANGE CITY - The criminal case against former police officer Nicholas Albert 'Chu' Rincones was postponed at the request of the defense. That the Court determined this week. The Public Prosecutor (OM) did not object to the postponement, which the court decided the case moved to March 25, 2010. Prosecutor accuses Rincones of violation of the Firearms Regulation and embezzlement in employment. He was arrested on September 4, 2009 for illegally possessing a firearm. He was currently awaiting a certificate of good conduct in order as new head of immigration to get started at the airport. It was on firearm by a citizen several years ago as part of a fundraising of the firearms handed police Rincones. He has this weapon apparently never returned. On September 23, the custody of Rincones ended and he was allowed out of the KIA. 08.15 b.t.k. k. is wordo acusa of, for realizacion of the crimen cu the had proponi for take life of one person, owing to intencionalmente strike the person ey cu cabo of one piek in his cabez on 25 of july 2009. pro form. 08.15 c.a.b. 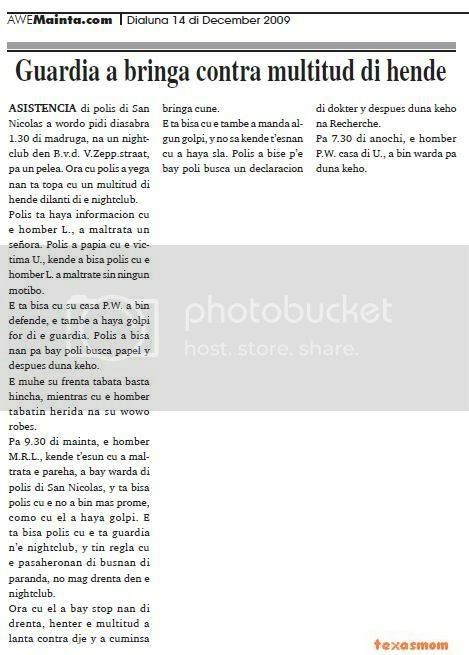 b. is wordo acusa of, conhuntamente cu one another or others, ladronicia in one cas of joyas y/of perfume y more pertenencia of one person on 7 of august 2009. also the is wordo acusa of, conhuntamente cu one another or others, ladronicia in one cas of joyas y/of laptop y other pertenencia of one person on 10 august 2009. b. is wordo alavez acusa of, conhuntamente cu one another or others, attempt of ladronicia in one cas on 10 of august 2009. pro form. 08.15 i.a.a. i.a. is wordo acusa of, conhuntamente cu one another or others, ladronicia cu violencia of 3.620 guilder y/of 298 dollar, pertenencia of owner of one restaurant on 20 of june 2009. also the is wordo acusa of, conhuntamente cu one another or others, ladronicia cu violencia of 300 guilder y/of carchinan of telephone, propiedadnan of owner of one bar- restaurant on 29 of june 2009. i.a. is wordo alavez acusa of, conhuntamente cu one another or others, ladronicia cu violencia of 600 for 700 guilder y/of carchinan of telephone, pertenencianan of owner of one restaurant on 17 of august 2009. more far l.a. is wordo acusa of, conhuntamente cu one another or others, ladronicia cu violencia of 1.200 guilder y/of carchinan of telephone y/of beverage, propiedadnan of owner of one restaurant on 18 of august 2009. the is wordo acusa of, conhuntamente cu one another or others, ladronicia cu violencia of 345 guilder y/of cigaria y/of beverage, pertenencianan of owner of one bar- restaurant on 10 of september 2009. also the is wordo acusa of, conhuntamente cu one another or others, posesion of one or more pistool y/of revolver y/of patronchi skerpi in the period of 1 may 2009 till 10 of september 2009 y in the period of 20 of june 2009 till 10 of september 2009, without cu had permission for esakinan. pro form. 09.00 j.a.l.m. m. is wordo acusa of owing to intencionalmente take life of one person on 24 of april 2009, by of at form calmo y dicidido, hinca person here several trip cu one cuchio stiletto at his nek, owing to consecuencia of cual the person owing to abide such damage cu past owing to arrive at fayece. 09.15 j.a.p.l. p.l. is wordo acusa of, for realizacion of the crimen cu the had proponi for intencionalmente take life of one person, owing to intencionalmente y after of deliberacion trankil hinca the person here cu one cuchio more trip in his cabez y/of nek on 6 of september 2009. also the is wordo acusa of owing to intencionalmente owing to hinca y/of clip one another person more trip cu one cuchio at his hand on 6 of september 2009, by of cual the person here owing to resulta injury y/of owing to abide dolor. p.l. is wordo acusa alavez of, for realizacion of the crimen cu the had proponi for intencionalmente take life of one of three person, owing to intencionalmente y after of deliberacion trankil hinca the person here cu one cuchio in pecho y at his sei on 6 of september 2009. the is wordo acusa of intencionalmente owing to hinca y/of clip one of cuatro person at his heup on 6 of september, by of cual the person here owing to resulta injury y/of owing to abide dolor. 10.45 e.n.h. h. is wordo acusa of posesion of one pistool in the period of first of may 2009 till 4 of september 2009, without cu the had permission for this. also the is wordo acusa of owing to menaza one y/of more person for one crimen contra they life on 4 of september 2009, by of punta the pistol on they y bisa: “si do you sundra my mother once more, will my throw bo”. 11.30 e.f.r. r. owing to wordo acusa of owing to intencionalmente y cu premeditacion did take life of one person on 19 of july 2009, by of intencionalmente y after of deliberacion trankil owing to los one or more tiro in cara of the person here, owing to consecuencia of cual past owing to come at fayece. pro form. 11.45 r.a.g. y c.p.b. ontnemingsvordering (claim denial). pro form. one madam diarazon owing to ask asistencia of police at san nicolas, for one caso of attempt of kiebro. n’e cas in trinitariastraat, police owing to talk cu madam h.b. of 70 year, that owing to tell police cu diarazon 11.30 of afternoon, ladronnan owing to try of break enter his cas, but they not owing to succeed they aim y apart from esey owing to injury they self. police owing to see cu the madam place one lock extra n’e window. the ladronnan owing to break the window, but not owing to succeed break the of two lock y apart from esey owing to injury they self also, because; cu they owing to let lastro of blood. police owing to coy they vingerprint, y is follow cu the investigacion. jacqueline feliciana noguera owing to bark cry hour past owing to hear fiscal exigi 9 year of jail p’e. fiscal owing to acusa jacqueline feliciana noguera cu day 31 of half 2009 in oranan of marduga intencionalmente y premedita coriendo car bao influencia of alcohol y cu velocidad high owing to strike charles ramada mora kill cu car y core bay. fiscal owing to follow tell cu jacqueline owing to believe cu past owing to kill his casa aldrin noguera, but provided that realidad owing to kill person robez cu was dress casi same cos cu aldrin noguera. the accidente hororoso here owing to sosode near of wayaca residance y aldrin noguera owing to calling 911 y owing to tell cu probably his madam jacqueline feliciana noguera is envolvi in the accidente here. past owing to tell cu hour past owing to arrive his cas at tanki leendert, past owing to achieve the car break y cu blood on dje. according aldrin noguera, the was together cu his madam in car y by cu the madam was core much iresponsabel, past owing to descend for of the car at height of aeropuerto y hour past owing to arrive cas cu taxi past owing to see sla at car. past owing to bay arise jacqueline for puntr’e of this y jacqueline owing to mustr’e for stay keto y owing to bay sleep. police owing to present n’e cas y owing to detene jacqueline, that till day of today is close at kia. huez owing to show cu jacqueline feliciana noguera during interogacion at police owing to stay tell of do not corda nothing y owing to lamenta thing owing to sosode. huez owing to show also cu have guardianan of aeropuerto cu owing to come across cu aldrin noguera on caminda at aeropuerto very agitated. aldrin noguera owing to bay serca they y owing to tell they cu his madam wanted happen car on dje y for calling one taxi p’e. the taxista cu owing to take away aldrin owing to tell cu aldrin was much agitated y owing to tell cu his madam was much histerico y core iresponsabel y was bao influencia of alcohol. police is sospecha cu for one motibo or another jacqueline feliciana noguera will wanted owing to kill his casa. jacqueline, after of owing to descend his casa at height of aeropuerto, owing to go back y owing to strike the victima y lastre 60 metre keriendo cu is his casa, but is person robez. t’asina cu have problem in the pareha y actualmente they're in the proceso of divorcio. aldrin noguera does not divorcia, but jacqueline is insisti. now owing to arrive so far cu jacqueline is let aldrin cu cas, car y yiunan immidiately p’e achieve his freedom. huez is achieve this very odd. huez owing to follow tell cu the raport of psychiater is show cu jacqueline feliciana noguera, by of consumo of alcohol, various trip owing to abide blackout, but do not tell his casa. psychiater do not achieve jacqueline is abide of problem mental y is hay’e responsible for his actonan. psychiater owing to señala cu jacqueline have problem cu consumo of alcohol y will have to of guia. fiscal owing to show cu jacqueline y aldrin owing to leave together y owing to drink at various lugar. despite of owing to feel of not was apto for core car, tog jacqueline owing to haci this, because the had the key of car. 600 microgram of alcohol in breath is much y this is afecta reaccion of one person cu is stuur. according fiscal, have indicacion cu various trip aldrin owing to wing jacqueline his atencion cu the was core mucho duro. fiscal owing to tell cu is of compronde cu aldrin not can believe cu jacqueline will wanted mat’e. jacqueline owing to tell cu the do not corda nothing y esey is confirma the mature cu the was intencionalmente bao of influencia of alcohol. fiscal is achieve cu jacqueline had intencion of kill aldrin. jacqueline owing to believe cu past owing to strike aldrin cu car, but owing to strike person robez cu was dress cu casi the same cloths cu aldrin. is inaceptabel cu for casualidad past owing to strike the victima y not owing to ocasiona none another accidente all the caminda for his cas. this is demasiado casualidad mirando all the camindanan cu past owing to core y even owing to staciona the car in garage. the is achieve cu jacqueline owing to using the car because; one arm for owing to kill his casa cu after owing to resulta of is person robez. fiscal is achieve cu is intencionalmente jacqueline owing to haci all this y cu the was bao influencia of alcohol. past owing to exigi 9 year of jail. jacqueline feliciana norguera owing to bark cry y owing to keep one rato first cu his advocate mr. chris lejuez owing to take away defence. huez will bay evalua the caso for after dicta sentencia. ORANGE CITY - The 34-year-old woman J.F. Yesterday an unconditional prison sentence of nine years to her demands heard. The Public Prosecutor (OM) considered it proven to be the night of May 31 and deliberately driving the 34-year-old Charles Ramada Miguel Mora has run over. She assumed that her husband was slain, but is actually drove the wrong person, the prosecutor said. After the collision was the woman fled, but was several hours later at her home in Tanki Leendert arrested. Her husband had when he called the authorities because his wife with injuries and had seen the damaged car home. He immediately suspected that there was an accident. Moments earlier because he had gotten out of the car near the airport because he thought his wife irresponsible speeding. There he took a taxi home, where he found the car. His wife was already in bed. When he woke, she said that he had to be quiet and go to sleep. Moments later the woman was arrested. The police immediately suspected that F. her husband, after she had deposited him at the airport, wanted to murder. The couple was in a divorce. The man would not want to divorce, but F. do. According to police, the wife of her ex-husband would order the children and her freedom back. But instead of that night to run over her husband, so she drove the wrong person. This was killed. The psychiatric report showed that the woman several times has had a black out from too much alcohol. The psychiatrist concluded that F. allocation was open during the incident, but an alcohol problem and therefore needs help. The suspect himself has stated that they no longer remember the incident. The prosecutor showed that F. on May 31, quite under the influence during the trip with her husband. Nevertheless, she insisted that she would drive cars. The husband has stated that he does not believe that his wife would murder him, but prosecutor said in court yesterday that F. weldegelijk that intended. The officer is not likely that the woman accidentally hit someone and then drove home without a way to cause another accident. She also had her car home parked neatly in the garage, the officer said. The prosecution also found that F. her car as a weapon is used with the intention to kill her husband and demanded cell so nine years. yesterday morning huez owing to reduci the castigo exigi for fiscal for jacqueline feliciana norguera. huez owing to tell cu contrario at thing fiscal owing to trece front in his rekisitorio, the do not achieve prove asesinato premedita. huez owing to tell cu according fiscal, the madam owing to strike one person parecido at his casa cu car kill. fiscal owing to tell cu the madam, after of owing to descend his casa near of aeropuerto, owing to lora come bek y cu intencion dal’e cu car. huez owing to remarca cu can bien is cu the madam owing to become come bek, because past owing to achieve pity for thing owing to sosode or past owing to bay bek, because the wanted owing to coy ruta via santa cruz for bay bek. huez is achieve cu not have proof cu genuinely norguera owing to become bek intencionalmente for strike his casa kill cu car. huez owing to tell cu the do not comparti opinion of fiscal. the mature cu the madam was core zigzag, was because the was sober. the is believe cu jacqueline feliciana norguera owing to descend caminda at wayaca y strike person y follow core. according huez, not have none indicacion cu the madam have motibo for kill his casa. 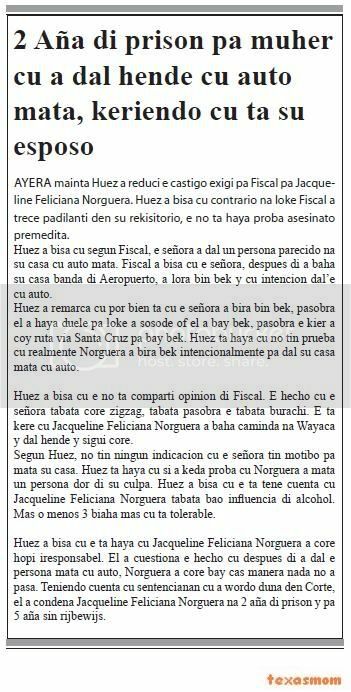 huez is achieve cu if owing to stay prove cu norguera owing to kill one person by of his culpa. huez owing to tell cu the is as cuenta cu jacqueline feliciana norguera was bao influencia of alcohol. more or less 3 trip more cu is tolerable. huez owing to tell cu the is achieve cu jacqueline feliciana norguera owing to core much iresponsabel. past owing to cuestiona the mature cu after of owing to strike the person kill cu car, norguera owing to core bay cas as nothing not owing to happen. teniendo cuenta cu sentencianan cu owing to wordo give in corte, past owing to condena jacqueline feliciana norguera at 2 year of jail y for 5 year without rijbewijs (drivers license). according huez the pruebanan was sufficient for owing to as ras deteni till at the instant cu el'a leave pound. huez owing to tell esey cu enfasis because; reaccion on the ponencia of the advocate cu ras will is inocente. if provided that berdad ras is inocente, then will not owing to as in detencion, according ministerio publico. ministerio publico is follow tell cu the rapportnan of police is encera the investigacion of dna y the investigacion of the schiethanden. interesting is naturlamente the dna, cu owing to resulta parcialmente negative, but cu parcialmente is still in investigacion. dus the investigacion of dna still is andando for one part. the schiethanden owing to resulta negative. for thing is the declaracionnan, is so cu now here have testigonan is come back on they word. the investigacion is continua y on 12 of feburary the tratamento will take lugar. is more tanto one cuestion bewijstechnisch. ministerio publico is follow completamente convenci cu they have the sospechoso y cu is the, but have cu proof this convincentemente at huez. we will stay pendiente for her conclusion of the caso interesting here, as cu already owing to wordo anuncia, day 12 of feburary, this will continua. huez yesterday owing to suspende the detencion of edsel ras, mihor conoci because; wakata, that was close acusa of will owing to kill one person some day happen. as is conoci, wakata ras is wordo sospecha of asesinato of one person just on the parkinglot of kooyman at tarabana. t’asina cu anteriormente his detencion owing to wordo prolonga pendiente investigacionnan cu ministerio publico owing to ask at laboratory forence of the netherlands. yesterday ministerio publico owing to present some of the resultadonan parcial, while cu owing to ask for pospone tratamento of the caso for day 12 of feburary 2010. t’asina cu the result of dna owing to leave parcialmente negative y also fiscal owing to present declaracionnan new of testigonan cu is haci cu the pruebanan cu ministerio publico have contra wakata ras owing to become zwak. advocate mr. edwin duijneveld owing to cuestiona the mature cu fiscal have edsel (wakata) ras deteni so tanto time without have have to. the is achieve cu have to let wakata ras pound. huez owing to tell cu till n’e instant ey had sufficient proof for owing to mantene edsel ras deteni because; sospechoso of asesinato. sinembargo the desaroyonan new is place cu the pruebanan is become zwak y pesey huez owing to suspende his detencion. the caso will follow day 12 of feburary 2010 y the sospechoso have to present in corte the day ey. huez comisario not owing to prolonga the detencion of cornelius wilson yesterday morning y consecuentemente owing to ordena for lag’e pound. t’asina cu yesterday once more wilson owing to present fast huez comisario, but the trip here huez comisario not owing to see motibo for go back prolonga his detencion. advocate mr. edwin duijneveld was contento cu past owing to succeed cu ir. cornelius wilson owing to achieve his freedom. the investigacionnan contra wilson because; sospechoso in the caso of malversacion in bendemento of casnan at seroe colorado is follow. ORANGE CITY - Cornelius Wilson (65) is at liberty. The judge decided yesterday the detention of the politicians not to extend, with the result that Wilson could again leave the prison KIA. He remains suspicious and the investigation continues, said the PPS. Wilson was arrested November 18 for bribery and forgery in a major corruption scandal involving land and housing in the district in Seroe Colorado Colony, San Nicolas. Is still unclear what proportion of Wilson in this case. The prosecution wanted about the importance of the study lost nothing. Wilson's lawyer, Edwin Field Duijn, is certainly pleased that his client is at liberty. Beginning in November was also made to search the former leader of Summum Bonum and number three on the list of MSI during the elections last September. With the arrest of Wilson, the number of arrests in the case came on five. In July, four women and one man arrested including two officials of Department of Infrastructure and Planning (DIP). Expressions are suspected of fraud, bribery, and forgery. asistencia of police owing to wordo ask diahuebs nightfall 2’or at one cas at tamarijn, where ladronnan owing to break window y owing to enter inside. n’e cas police owing to talk cu he therefore., that is tell police cu among 10’or pa12’or of afternoon, the ladronnan owing to enter in the cas. the is tell cu they bay cu among another, playstation, nintendo, camara, holoshi of gold, various jewel y beverage alcoholico. also they owing to bay cu one receiver of direct t.v. the caso is in investigacion. he a.k. naci at the netherlands diarazon nightfall 3’or owing to calling keep of police of north y is ask asistencia for one ladronisia. police is bay n’e cas y eynan the owner is tell they cu ladronnan owing to enter in the cas via of door behind y the bay cu various articulo, among another laptop. two camara digital, y several cos more. also they owing to bay cu beverage alcoholico y some joyas. the will send one list of locual cu owing to wordo steal. saturday madruga owing to enter informacion of cu one car cu owing to being steal for of the parkinglot fast of poli-clinica at hospital. at arrival of the patrol policial n;e sitio the personal of seguridad sit n’e door of cura, not owing to let the patrol happen without more. the polisnan have to owing to give all clase informacion for they can enter. we is believe cu the person here not can is one aruban. unabes polsi is inside at once owing to come across cu the owner of the car cu owing to being steal for of eyden. the owner owing to give descripcion y datonan of the car. 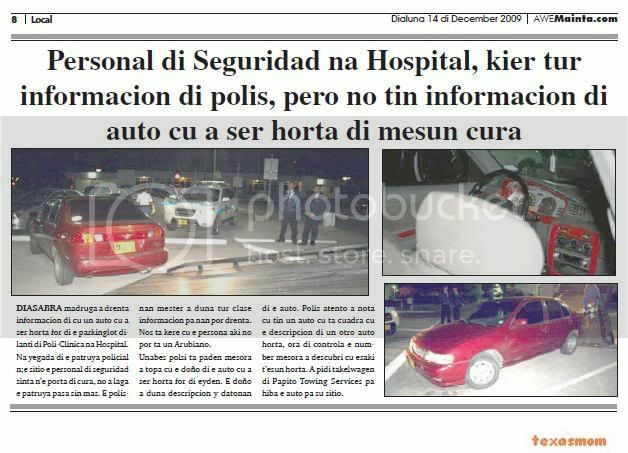 police attentive owing to notice cu have one car cu is cuadra cu the descripcion of one another car steal, hour of controla the number at once owing to descubri cu this t’esun steal. owing to ask takelwagen of papito towing services for take away the car for his sitio. presencia of police owing to wordo ask saturday 2’or of madruga at hospital, on the parkeerplaats of eerste hulp at hospital, where ladronnan owing to bay cu one nissan sunny. n’e sitio police is talk cu the guardia, that is tell police cu one person owing to stop his nissan sunny 10 or of night, y for 2’or the car owing to disparce. at his lugar, they owing to let one nissan sentra cora a-17679 behind. they're tell police cu 6 boy owing to come cu the nissan cora y one tercel blao. three owing to leave for of the nissan cora y owing to enter in the nissan sunny y after they owing to bay for of the sitio, lagando the sentra behind. police owing to takel the sentra hibe keep of police at north. all locual cu owing to happen is graba on video. saturday madruga 3.30, police is see the nissan sunny cu owing to wordo steal at hospital is core in frankenstraat. police owing to follow they slow y near of 080 café, the chofer owing to hera strike two peaton cu the car. at alto vista the chofer owing to lose control y owing to strike contra one car stop near of caminda. after they owing to follow core y owing to stick the car behind huang zang supermarket. the 3 child hombernan owing to descend for of the car y owing to try core bay, but police owing to detene all 3. they're r. sint j. of 17 year, j.f. of 14 year y l.c. of 15 year. all 3 is children conoci because; thief of car y live at tamarijn. they owing to stay close for investigacion. 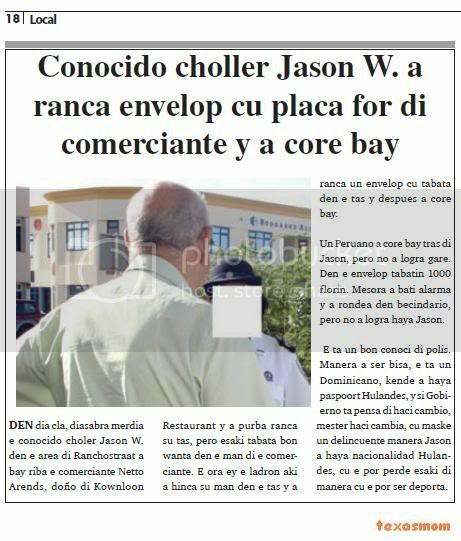 in day cla saturday afternoon the conocido choler jason w. in the area of ranchostraat owing to bay on the comerciante netto arends, owner of kownloon restaurant y owing to try ranca his bag, but this was good wanta in the hand of the comerciante. the hour ey the thief here owing to hinca his hand in the bag y owing to ranca one envelop cu was in the bag y after owing to core bay. one peruvian owing to core bay behind jason, but not owing to succeed gare. in the envelop had 1000 guilder. at once owing to beat alarma y owing to rondea in becindario, but not owing to succeed achieve jason. the is one good conoci of police. as owing to being tell, the is one dominicano, that owing to achieve paspoort dutch, y if gobierno is think of haci cambio, have to haci change, cu although one delincuente as jason owing to achieve nacionalidad dutch, cu the can lose this of as cu the can being deporta. asistencia of police of san nicolas owing to wordo ask saturday 1.30 of madruga, at one nightclub in b.v.d. v.zepp.straat, for one action. hour cu police owing to arrive they're come across cu one multitud of person fast of the nightclub. police is achieve informacion cu he l., owing to maltrata one madam. police owing to talk cu the victima u., that owing to tell police cu he l. owing to maltrate without none motibo. the is tell cu his casa therefore.w. owing to come defende, the also owing to achieve golpi for of the guardia. police owing to tell they for bay poli busca paper y after give complaint. she his forehead was enough swell, while cu he had injury at his eye left. for 9.30 of morning, he m.r.l., that t’esun cu owing to maltrata the pareha, owing to bay keep of police of san nicolas, y is tell police cu the not owing to come more first, because; cu past owing to achieve golpi. the is tell police cu the is guardia n’e nightclub, y have regulation cu the pasaheronan of busnan of paranda, not mag enter in the nightclub. hour cu past owing to bay stop they of enter, all the multitud owing to arise contra dje y owing to cuminsa fight cune. the is tell cu the also owing to send some golpi, y not know that t’esnan cu owing to achieve sla. police owing to bise p’e bay poli busca one declaracion of doctor y after give complaint at recherche. for 7.30 of night, he therefore.w. casa of u., owing to come keep for give complaint. one inhabitant of pos diminutive cu owing to achieve visit of thief owing to calling police diabierna night 11.30, y is tell cu ladronnan owing to break enter in his cas. the is tell cu they owing to enter via of door behind y for of one wardrobe they're bay cu 6 thousand guilder at joyas y also 1300 guilder cash. the is tell cu they owing to bay cu two video camara, two holoshi, cloths, zapato y also they owing to try bay cu one computer, but not owing to succeed. police did take his complaint. 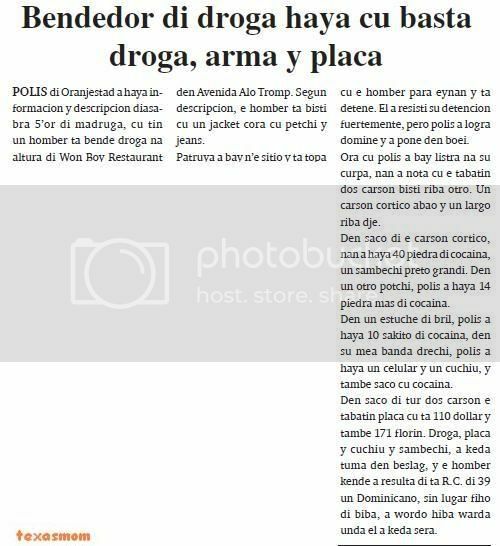 police of oranjestad owing to achieve informacion y descripcion saturday 5’or of madruga, cu have one man is sell drugs at height of won boy restaurant in avenida alo tromp. according descripcion, he is dress cu one jacket cora cu petchi y jeans. patrol owing to bay n’e sitio y is come across cu he stop eynan y is detene. past owing to resisti his detencion strongly, but police owing to succeed domine y owing to place in boei. hour cu police owing to bay listra at his curpa, they owing to notice cu the had two carson dress on another. one carson cortico abao y one largo on dje. in saco of the carson cortico, they owing to achieve 40 stone of cocaina, one sambechi black big. in one another potchi, police owing to achieve 14 stone more of cocaina. in one estuche of spectacles, police owing to achieve 10 sakito of cocaina, in his stockings near right, police owing to achieve one celular y one cuchiu, y also saco cu cocaina. in saco of all two carson the had coin cu is 110 dollar y also 171 guilder. drugs, coin y cuchiu y sambechi, owing to stay take in beslag, y he that owing to resulta of is r.c. of 39 one dominicano, without lugar fiho of live, owing to wordo take away keep where past owing to stay close. Page created in 6.229 seconds with 19 queries.